Duration: One-semester course offered in spring (17 weeks). Description: Graphic & Web Design is an introduction to front-end web development. Students will code a website using HTML and CSS, and design graphics using image editing software. What kind of computer do I need for Graphic & Web Design? For Graphic & Web Design, students will need a laptop or desktop computer with Windows, MacOS or Linux operating system on it. What topics will I learn about in Graphic & Web Design? Graphic & Web Design is an introduction to front-end web development. Students will code a website using HTML and CSS, and design graphics using image editing software. In the second part of the course the student will get familiar with design concepts, tools to design with and of course will get started designing their own art in the form of logos, brochures and eventually professional mockups that they can use to create websites. Every student will have a professional looking website at the end of the course that will also function as their practical final assignment. How much homework is in Graphic & Web Design? What books will I use in Graphic & Web Design? The official booklist for Graphic & Web Design is available now. In the official booklist, you will find information about the editions, book descriptions, and ISBN numbers. Am I ready to take Graphic & Web Design? This is a high school-level course. Students are expected to read and comprehend at a high school level, to study independently, and to keep up with course assignments. They must take the initiative to study the syllabus, remain aware of course deadlines, be prepared for live class sessions, and ask for help when help is needed. We have specifically designed the Graphic & Web Design course to appeal to students who are complete beginners and for students that have taken the Computer Skills course. This course is recommended for any students from 10th through 12th grade. What is a Live Online Class Session in Graphic & Web Design? 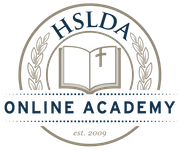 In every HSLDA Online Academy course, students meet weekly with their instructor and classmates in an online classroom for additional teaching, discussion, Q&A, or group activities. The class sessions are interactive and are conducted using a web meeting software with video, audio, chat, and application sharing capabilities. What if I have a schedule conflict with listed Graphic & Web Design class times? What is the tuition for Graphic & Web Design?